GM-CSF stimulates the development of and the cytotoxic activity of white blood cells. Granulocyte-macrophage colony-stimulating factor (GMCSF) is a cytokine that acts in hematopoiesis to stimulate growth and differentiation of hematopoietic precursor cells from various lineages including granulocytes, macrophages, eosinophils and erythrocytes [(PUBMED:2458827), (PUBMED:1569568)]. GMCSF is a glycoprotein of ~120 residues that contains 4 conserved cysteines that participate in disulphide bond formation. 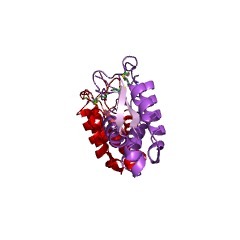 The crystal structure of recombinant human GMCSF has been determined [(PUBMED:1569568)]. There are two molecules in the asymmetric unit, which are related by an approximate non-crystallographic 2-fold axis. The overall structure, which is highly compact and globular with a predominantly hydrophobic core, is characterised by a 4-alpha-helix bundle. The helices are arranged in a left-handed anti-parallel fashion, with two overhand connections. Within the connections is a two-stranded anti-parallel beta-sheet. 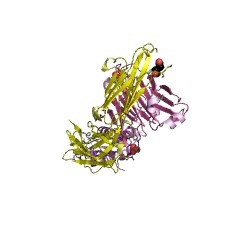 The tertiary structure has a topology similar to that of Sus scrofa (pig) growth factor and interferon-beta. Most of the proposed critical regions for receptor binding are located on a continuous surface at one end of the molecule that includes the C terminus [(PUBMED:1569568)]. There are 76 CSF2 domains in 76 proteins in SMART's nrdb database. Taxonomic distribution of proteins containing CSF2 domain. This tree includes only several representative species. 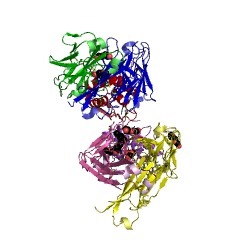 The complete taxonomic breakdown of all proteins with CSF2 domain is also avaliable. 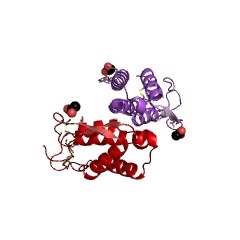 Click on the protein counts, or double click on taxonomic names to display all proteins containing CSF2 domain in the selected taxonomic class. 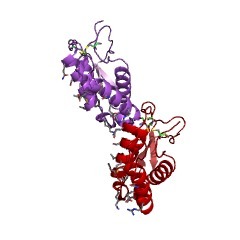 Novel fold and putative receptor binding site of granulocyte-macrophage colony-stimulating factor. Granulocyte-macrophage colony-stimulating factor (GM-CSF) stimulates the development of and the cytotoxic activity of white blood cells. Recombinant human GM-CSF has proven useful in the treatment of blood disorders. 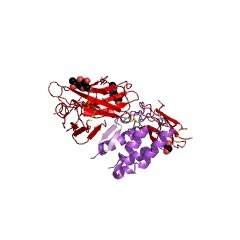 The structure of GM-CSF, which was determined at 2.4 angstrom resolution by x-ray crystallography, has a novel fold combining a two-stranded antiparallel beta sheet with an open bundle of four alpha helices. 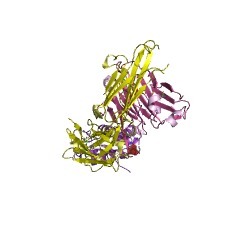 Residues implicated in receptor recognition, which are distant in the primary sequence, are on adjacent alpha helices in the folded protein. 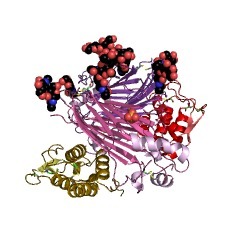 A working model for the receptor binding site is presented. Isolation of cDNA for a human granulocyte-macrophage colony-stimulating factor by functional expression in mammalian cells. A cDNA sequence coding for a human granulocyte-macrophage colony-stimulating factor has been isolated from cDNA libraries prepared from mRNA derived from concanavalin A-activated human T-cell clones. 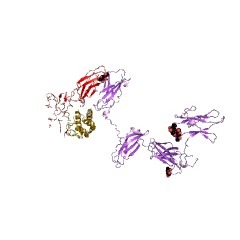 The libraries constructed in the pcD vector system were screened by transfecting COS-7 monkey cells with DNA pools to express the products encoded by full-length cDNA inserts. By assaying the cell supernatants, we identified clones encoding a factor that stimulates the formation of granulocyte and macrophage colonies from human progenitor cells. These results demonstrate that identification of full-length cDNAs for many colony-stimulating factors may be achieved entirely on the basis of detecting the functional polypeptide produced in mammalian cells. This information is based on mapping of SMART genomic protein database to KEGG orthologous groups. 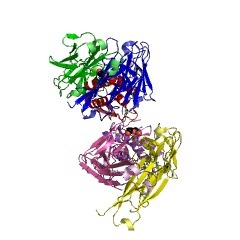 Percentage points are related to the number of proteins with CSF2 domain which could be assigned to a KEGG orthologous group, and not all proteins containing CSF2 domain. Please note that proteins can be included in multiple pathways, ie. the numbers above will not always add up to 100%.